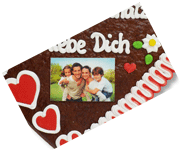 Classic as well as the Oktoberfest and at the fair: Our personalized photo gingerbread hearts are ideal for many occasions and are, as the name suggests, with lettering and photo , which we print for you with food coloring on edible sugar paper and then put on the gingerbread , The individual Fotolebkuchenherz without minimum order quantity already available from 1 piece and it is 100% edible and can be supplemented with your favorite photo and made as desired with our configurator online. 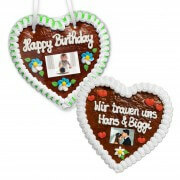 > Have gingerbread hearts printed with your own photo - for every occasion! It's so easy for us! 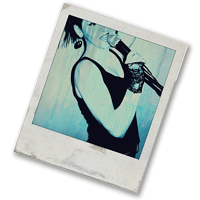 Choose a digital photo and upload it. If you do not have a photo on hand, surely you have a cell phone photo? Or simply scan your already printed image or take a picture with your mobile phone. If you then e-mail it yourself and save it to your desktop, you can immediately upload it online in the Configurator. And of course, the better the resolution and image quality, the better the print quality of the Essfoto. You do not have the right photo yet? No problem! We have found a guide for you, with which you will surely come to a great picture! Here are 5 tips for taking pictures. Here, technical prerequisites play virtually no role. The rule, however, is the better the photo quality, the better the printed product. That also applies to us. We would therefore recommend uploading a high-resolution photo with a lot of megabytes (mb) - because then your personal gingerbread photo will be a success! One should know, however: The edible pressure on edible paper is not 100% comparable to a normal photo paper. Of course, we'll adjust your photo to the maximum available. The picture is printed rectangular and depending on the size of the heart the photo has a maximum dimension of 13x9cm. With us in the gingerbread market you can find gingerbread hearts in various sizes from small 16cm to the giant gingerbread heart XXL ca. 50cm with photo ! The bigger the gingerbread heart, the bigger the picture and the more text fits the gingerbread heart. The design is of course optimally adapted to your wishes, almost as if you had done it yourself! 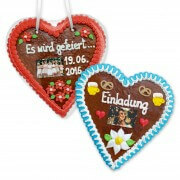 Order today in the online shop and bring the feeling of Munich to your friends home. Decide how big your photo should be and choose one of our heart sizes accordingly. Now choose from different decorations. The designs are designed to suit all occasions. Choose a border color in which your heart will be printed. Decide on a desired text of your choice. Choose the font color that underlines your personal message. Wishes or questions? Then write us a message! Now you can add the product to the cart and buy it directly. There you choose the payment method that suits you best! 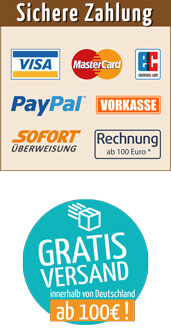 Whether credit card, PayPal, prepayment or Sofortüberweisung, we bake immediately after receipt of payment. If things need to be done quickly, we will not be able to make it all out for 24 hours, but with the Super-Express delivery , the gingerbread heart with picture will be at your home within 2 working days. 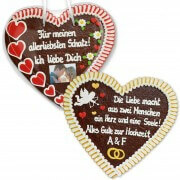 Choose a product of your choice from our saying gingerbread hearts and get your heart of desire within a day. 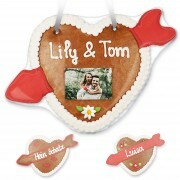 Have gingerbread hearts printed with your own photo - for every occasion! 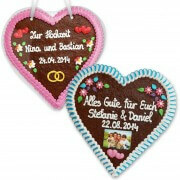 You do not know what to give for your wedding, birthday, mother's day or other occasions ? What is there better and more personal than a self-designed photo gift ! Combine a souvenir photo of a moment, such as from vacation, a party or a trip together, where you like to remember with a nice saying or congratulations. There are no limits to your imagination and of course there are many more shapes and types of individual gingerbread hearts here. 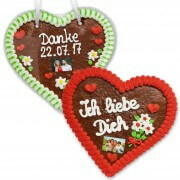 Or use the photo gingerbread as a memento and especially for the wedding. If you now have your photo gingerbread heart printed with an individual lettering, you have an extraordinary idea as a thank you or a gift for your wedding guests. Each guest is happy about a heart with a photo of the bride and groom. Here not only memories are maintained, but your wedding photo also gets the perfect setting. Especially for the birthday of good friends and family, we often despair of a personal gift idea, because we want to let the recipient know how much we like him or her. Congratulations on a birthday card is unfortunately not enough. After all, it is supposed to express that it comes from the heart and, moreover, is best done by yourself . A gingerbread printed with a photo is definitely a creative gift . Scour your analogue photo albums and digital folders, you will find at least a matching image to make a very special birthday greeting or congratulations!